Some of my Brazilian readers seem to be upset that I used "No Mas", Spanish words, rather than Portuguese ones, in the title. To be honest I was not thinking about language, but instead about a boxing match from decades ago, where Roberto Duran used these words to give up in his bout with Sugar Ray Leonard. In November 2014, in a post titled “Go where it is darkest”, I repeated a theme that has become a mantra in my valuation classes. While it easiest to value mature, money-making companies in stable markets, I argue that the payoff to doing valuation is greatest when uncertainty is most intense, whether that uncertainty comes from the company being a young, start-up without a business model or from macroeconomic forces. The argument is based on the simple premise that your payoff is determined not by how precisely you value a company but how precisely you value it, relative to other people valuing the same company. When faced with boatloads of uncertainty, investors shrink from even trying to do valuation, and even an imprecise valuation is better than none at all. It is to illustrate this point that I chose Vale and Lukoil as my candidates of doom, assaulted by dropping commodity prices (oil for Lukoil and iron ore prices for Vale), surging country risk (Russia for Lukoil and Brazil for Vale) and plummeting currencies (Rubles for Lukoil and Reais for Vale). I valued both companies, but it is the valuation of Vale that is the focus of this post and it yielded a value of $19.40/share for a stock, that was trading at $8.53 on that day. 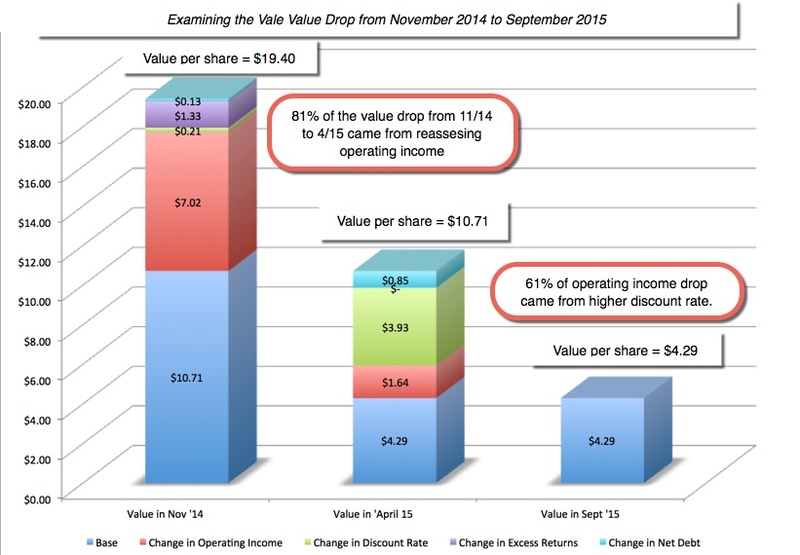 The narrative that drovemy valuation was a simple one, i.e., that iron ore prices and country risk would stabilize at November 2014 levels, that the earnings over the last twelve months (leading into November 2014), which were down 40% from the previous year’s numbers, incorporated the drop in iron ore prices that had happened and that eventually Vale would be able to continue generating the mild excess returns it had as a mature mining company. I did buy Vale shares after this analysis, arguing that there was a buffer built into earnings for further commodity price decline. In April 2015, I revisited my valuations, as the stock prices of both companies dropped from the November 2014 levels, and I labeled the post “In search of Investment Serenity”. The post reflected the turmoil that I felt watching the market deliver a negative judgment on my initial thesis, and I wanted to check to see if the substantial changes on the ground (in commodity prices, country risk and currency levels) had not changed unalterably changed my thesis. 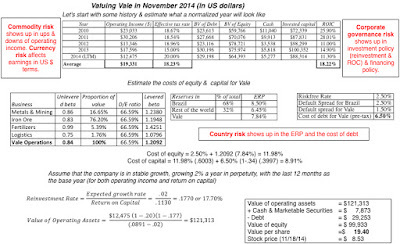 Updating my Vale valuation, the big shifts were two fold. First, the trailing 12-month earnings that formed the basis for my expected value dropped a third from their already depressed levels six months earlier. 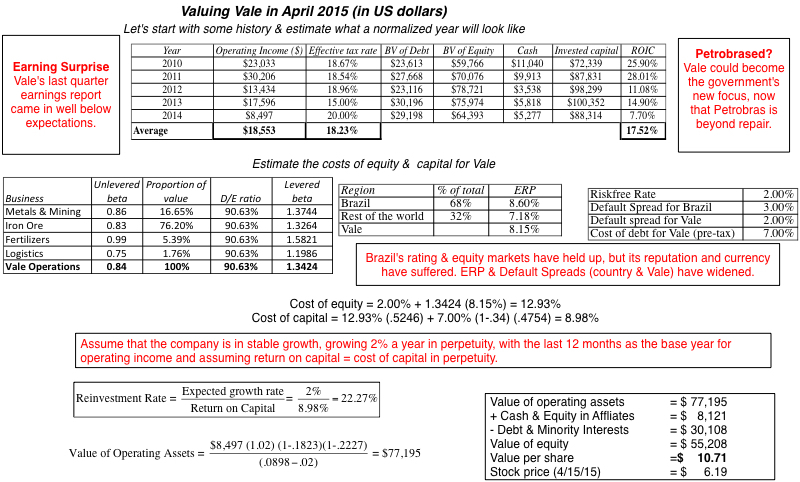 Second, the implosion in Petrobras, the other large Brazilian commodity company, caused by a toxic combination of poor investments, large debt load and unsustainable dividends, raised my concern that Vale, a company that shares some of the same characteristics, might be Petrobrased. Again, I made the assumption that the trailing 12-month numbers reflected updated iron ore prices and revalued the company, this time removing the excess returns that I assumed in perpetuity in my earlier valuation, to arrive at a value per share of $10.71. I concluded, with a nod towards the possibility that my conclusions were driven by my desire for confirmation bias (confirming my earlier judgment on Vale being under valued), that while I might not have been inclined to buy Vale in April 2015, I would continue to hold the stock. 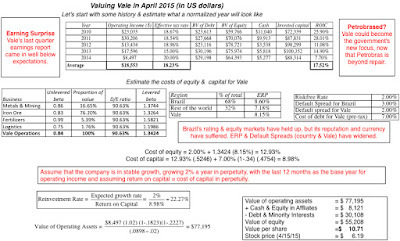 The months since my last valuation (in April 2015) have not been good for Vale, on any of the macro dimensions. The price of iron ore has continued to decline, albeit at a slower rate, over the last few months. That commodity price decline has been partially driven by the turmoil in China, a country whose massive infrastructure investments have been responsible for elevating iron ore prices over the last decade. The political risk in Brazil not only shows no signs of abating, but is feeding into concerns about economic growth and the capacity of the country to repay its debt. 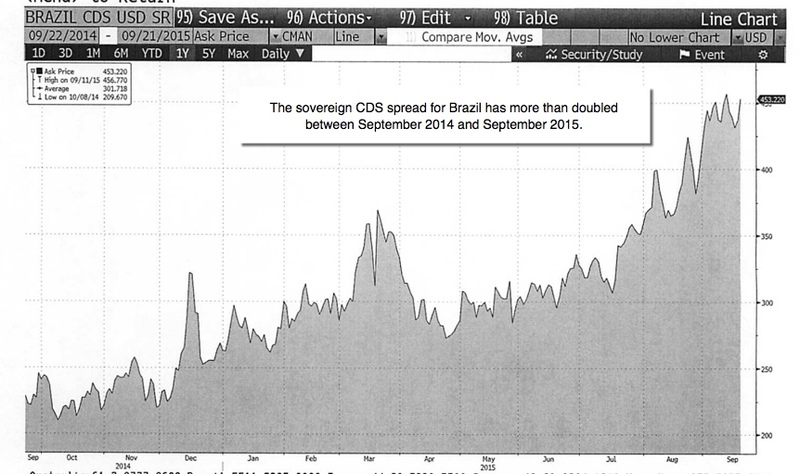 The run-up that we saw in Brazilian sovereign CDS prices in April 2015 has continued, with the sovereign CDS spread rising above 4.50% this week. The ratings agencies, as always late to the party, have woken up (finally) to reassess the sovereign ratings for Brazil and have downgraded the country, Moody’s from Baa2 to Baa3 and S&P from BBB to BB+, on both a foreign and local currency basis. While both ratings changes represent only a notch in the ratings scale, the significance is that Brazil has been downgraded from investment grade status by both agencies. 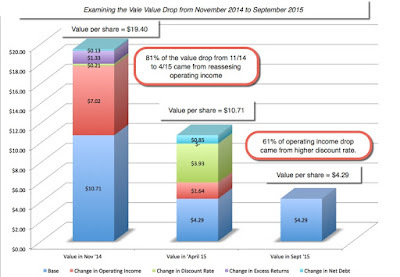 Finally, Vale has updated its earnings yet again, and there seems to be no bottom in sight, with operating income dropping to $2.9 billion, a drop of more than 50% from the prior estimates. While it is true that some of the write offs that have lowered earnings are reflections of iron ore prices in the past, it is undeniable that the earnings effect of the iron ore price effect has been much larger than I estimated to be in November 2014 or April 2015. Updating my numbers, and using the sovereign CDS spread as my measure of the country default spread (since the ratings are not only in flux but don’t seem to reflect the assessment of the country today), the value per share that I get is $4.29. 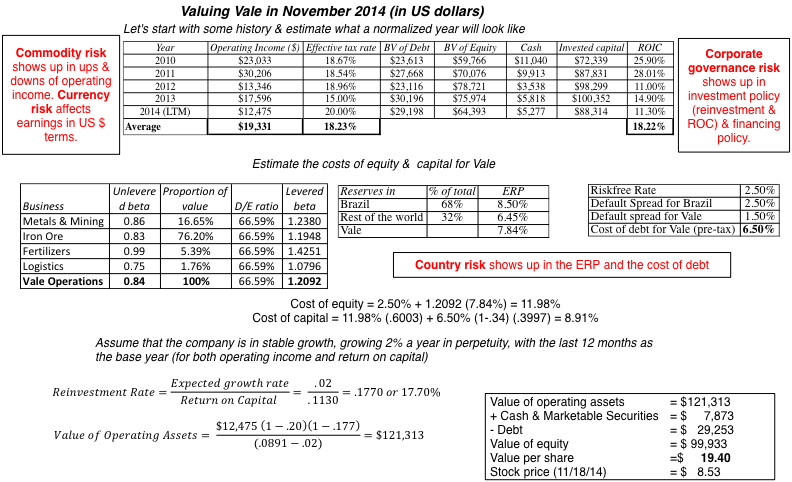 The biggest reason for the shift in value from November 2014 to April 2015 was the reassessment of earnings (accounting for 81% of my value drop), but looking at the difference between my April 2015 and September 2015 valuations, the primary culprit is the uptick in country risk, accounting for almost 61% of my loss in value. Vale: Time to Move on? The “if only” game: My first instinct is to play the blame game and look for excuses for my losses. If only the Brazilian government had behaved more rationally, if only China had not collapsed, if only Vale’s earnings had been more resilient to iron ore prices, my thesis would have been right. Not only is this game completely pointless, but it eliminates any lessons that I might be extract from this fiasco. The “what if” game: As I worked through my valuation, I had to constantly fight the urge to pick numbers that would let me stay with my original thesis and continue to hold the stock. 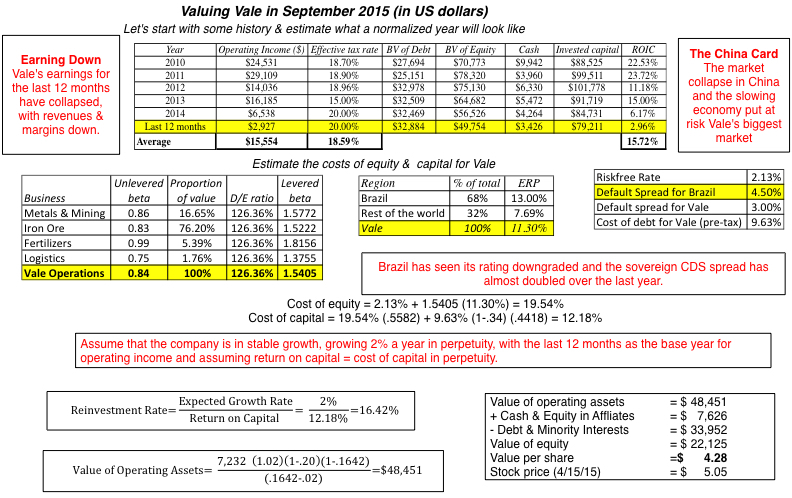 For instance, if I continue to use the rating to assess default spreads for Brazil, as I did in my first two valuations, the value that I get for the company is $6.65. I could have then covered up this choice with the argument that CDS markets are notorious for over reacting and that using a normalized value (either a rating-based approach or an average CDS spread over time) gives me a better estimate. 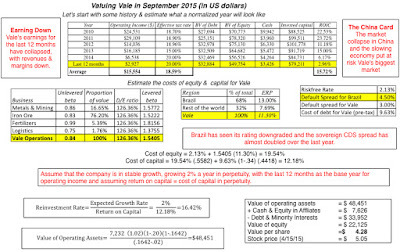 After wrestling with my own biases for an extended period, I concluded that the assumptions that I would need to make to justify continuing to hold Vale would have to be assumptions about the macro environment: that iron ore prices would stop falling and/or that the market has over reacted to Brazil’s risk woes and will correct itself. If there is anything that I have learned already from my experiences with commodity companies and country risk, it is that my macro forecasting skills are woeful and making a bet on them magically improving is wishful thinking. In fact, if I truly want to make a bet on these macro movements, there are far simpler, more direct and more lucrative ways for me to exploit these views that buying Vale; I could buy iron ore future or sell the Brazil sovereign CDS. I like Vale's management but I think that they have been dealt a bad hand at this stage, and I am not sure that they can do much about the crosswinds that are pummeling them. If you have more faith in your macro forecasting skills than I do, it is entirely possible that Vale could be the play you want to make, if you believe that iron ore prices will recover and that the Brazil's risk will revert back to historic norms. In fact, given my abject failure to get these right over the last few months, you may want to view me as a contrary indicator and buy Vale now. The dangers of implicit normalization: While I was careful to avoid explicit normalization, where I assumed that earnings would return to the average level over the last five or ten years or that iron ore prices would rebound, I implicitly built in an expectation of normalization by taking the last twelve-month earnings as indicative of iron ore prices during that period. At least with Vale, there seems to be a lag between the drop in iron ore prices and the earnings effect, perhaps reflecting pre-contracted prices or accounting lethargy. By the same token, using the default spread based on the sovereign rating provided a false sense of stability, especially when the market's reaction to events on the ground in Brazil has been much more negative. The Stickiness of Political Risk: Political problems need political solutions, and politics does not lend itself easily to either rational solutions or speed in resolution. In fact, the Vale lesson for me should be that when political risk is a big component, it is likely to be persistent and can easily multiply, if politicians are left to their own devices. The Debt Effect: All of the problems besetting Vale are magnified by its debt load, bloated because of its ambitious growth in the last decade and its large dividend payout (Vale has to pay dividends to its non-voting preferred shareholders). While the threat of default is not looming, Vale's buffer for debt payments has dropped significantly in the last year, with its interest coverage ratio dropping from 10.39 in 2013 to 4.18 in 2015. There are two lessons that I had already learned (and that I followed) that helped me get through this experienced, relatively unscathed. Spread your bets: The consequences of the Vale misstep for my portfolio were limited because I followed my rule of never investing more than 5% of my money in any new stock, no matter how alluring and attractive it looks, a rule that I adopted because of the uncertainty that I feel in my valuation judgments and that the market price moving towards my value. In fact, it is the basis for my post on how much diversification is the right amount. Never take investment risks that are life-style altering (if you fail): Much as I would like to make that life-altering investment, the one whose payoff will release me from ever having to think about investing again, I know it is that search that will lead me to take "bad" risks. Notwithstanding the punishment meted out to me by my Vale investment, I am happy to say that it has not altered my life choices and that I have passed the sleep test with flying colors. (I have not lost any sleep over Vale's travails). If I had known in November 2014 what I know now, I would obviously have not bought Vale, but since I don’t have that type of hindsight , that is an empty statement. I don’t like losing money any more than any one else, but I have no regrets about my Vale losses. I made the best judgments that I could, with the data that I had available in my earlier valuations. If you disagreed with me at the time of my initial valuation of Vale, you have earned the right to say "I told you so", and if you went along with my assessment, we will have to commiserate with each other. This is not the first time that I have lost money on an investment, and it will not be the last, and I will continue to go where it is darkest, value companies where uncertainty abounds and hope that my next excursion into that space delivers better results than this one. What's in a name? Of Umlauts, The Alphabet and World Peace! As the title should forewarn you, this is a post that will meander from eating spots to basketball players to corporate name changes. So, if you get lost easily, you may want skip reading it. It is triggered by two events that occurred this summer. One is Google's widely publicized decision to rename itself Alphabet and to reorganize itself as a holding company. The other is the much less public news that the eating place across the street from the building where I teach will be reopening with a new name "Bröd Kitchen", a new menu, and (probably) higher prices. In my post on my valuation class, I noted that this is my 30th year at New York University and I have seen the neighborhood around the school transition over time. When I started in 1986, I had my office and did the bulk of my teaching in the graduate school campus, which was downtown, but I lived near and still taught some classes at the undergraduate school. Right across the school was the Campus Coffee Shop (Yes! This is exactly what it looked like!) and it was exactly what its name suggested, an unpretentious coffee shop. The menu was primarily breakfast food, served all through the day, and the coffee came in one flavor (bitter), one texture (sludge) with only two add-ons (cream & sugar). The waiters and waitresses were all crotchety and old, viewed service as a foreign concept and I can only pity the poor person who tried to order a cappuccino or latte. To compensate, the coffee was only 50 cents, the egg sandwich about a dollar and you got what you paid for. About 15 years into my stint at Stern, the building's landlord (a brutally oppressive tyrant named New York University) decided that the campus coffee shop was too downscale and it was replaced by the Campus Eatery. This place offered fewer seats, a wider menu with paninis replacing sandwiches (as if putting a bad sandwich in a hot press can make it a good one) and machine-made cappuccinos that had neither milk nor espresso in them. Not surprisingly, the prices went up to reflect the name change from coffee shop to eatery, though the only edible items on the menu remained the breakfast items, albeit at twice the price you paid at the coffee shop. Update: I did a trial run this morning, since Bröd opened. Bought an iced coffee and a Cherry Danish (in keeping with the Scandinavian theme). Cost me $9.53 and it tasted just like the iced coffee and Danish that I get from the street cart that I usually go to.. and pay $2.50 for.. So, lesson learned! While these are three different businesses, with three different owners, they have all occupied the same space and I tend to think of them as the same eating place with three different names. That started me ruminating about why people and businesses change names and whether those name changes can affect the values that you attach to the entities involved. To decontaminate or escape: In some cases, a name may get contaminated to the point that changing it is the only way to escape the taint. When Philip Morris changed its name to Altria in 2001, it was partly an attempt to remove the taint of tobacco (and its associated lawsuits) from its then food and beverage subsidiaries (Kraft and Miller Brewing). While there may have been other reasons for Tyco Electronics to rename itself TE Connectivity in 2010, one reason may have been to disassociate itself from the accounting scandals at its parent company. To change: Changing your name can sometime make it easier for you to change yourself, as a person or how you operate, as a business. In this context, corporate name changes can cover the spectrum. Some name changes reflect changes that have already happened, as was the case when Apple Computer became Apple in 2007, a concession to the reality that it was deriving more of its revenues and profits from its smartphones, tablets and retail than from its computer business. It can sometimes be a precursor of changes to come, as was the hope at International Harvester, when it sold off its agricultural division to Tenneco, renamed itself Navistar in 1986, and worked to make a name for itself in the diesel engine and truck chassis markets. Finally, there is an escapist component to the some name change, where the firm is trying to get away from troubles and hopes that changing its name will help it in the endeavor. When Research in Motion changed its name to Blackberry in 2013, it was in an attempt to divert attention from declining sales and a business in trouble. To market: To make money, you have to sell your products and services, and not surprisingly, companies are drawn to names that they perceive will make it easier for them to market. In some cases, this may require simplifying your name to make it easier for customers to relate to; Tokyo Tsushin Kogyo did the right thing in 1958, when it renamed itself Sony. In still others, it may be designed to have a name that better fits your product or service; we should all be thankful that Larry Page and Sergey Brin changed their search engine's name from Backrub to Google a year into development. Finally, the name change may be to something more exotic, in the hope that this will give you pricing power; the only surprising thing about L’Oréal renaming of its US subsidiary, Cosmair, to L’Oréal USA was that it took so long to happen. After all, it must be a marketing maxim that having an accent in your name (the é in L’Oréal), in an Anglo-Saxon setting and that adding a apostrophe can only add to your cachet. To fool: In one of the more publicized frauds of the last century, a German named Christian Gerhartsreiter managed to fool East Court elite (both society and business) into thinking that he was Clark Rockefeller, using the last name to open doors to country clubs and financial opportunities. Corporations have played their own version of this game, incorporating the hot businesses of the moment to their names, whether it be dot.com in the 1990s, oil in the last decade or social media today. There are two points to note. The first is that these reasons are not mutually exclusive and more than one may apply for a given name change. The other is that the lines of separation between the reasons can also be fuzzy, with the one separating marketing and fooling investors being perhaps the most difficult one to delineate. Can changing your name change your value as a business or you as an individual? You may scoff, but I do believe that there are pathways to changing behavior or increasing value that begin with a name change. You will not find them if the name change is purely cosmetic or if your reason is to fool customers or investors, but you may, with any of the other reasons. Thus, if your rationale for the name change is to remove the taint of an old name or to market your product more easily, it should show up as higher revenues and profits, if you are right. If the name change is the first step in changing the way you run as a business, it should be manifested in your investing, financing and dividend decisions, and consequently in value. The proof, though, is in the results and it is true that the benefits are either transient or illusory in many cases. To back up the proposition that this is not just a phenomenon in technology stocks are unique to that time period in market history, a study looked at US and Canadian companies that added "oil" or "petroleum" to their names between 2000 and 2007, a period when oil prices are booming, and found that stock prices reacted positively to the addition, with US investors greeting the name change more effusively than Canadian investors. If history is any guide, these companies will now gain by removing "oil" from their names today, with oil prices at historic lows. What are the lessons from these studies? The first is that names do matter in markets and that companies sometimes choose names to please markets. The perils, as you can see even from the limited evidence that I have presented, is that investors are fickle and can change their minds and that a name that is value additive today can become value destructive in a while. A few weeks ago, Google shook up markets with its announcement that it was revamping the structure of the company, creating a holding company (Alphabet), with the core products of Google including Search, Ads, Maps, Apps, Android and YouTube, in one subsidiary (Google) and its experimental ventures in new businesses in other subsidiaries (though we will have to wait on the specifics). The immediate market reaction was positive, but as we noted in the last section, that effect can fade quickly. The longer term questions are two fold. Why did Google change its corporate name? Will the name change work? On the first question, it is my view that three of the reasons listed earlier can be ruled out almost immediately. Given how successful Google has been as a company, in terms of generating earnings and value for its investors, it is implausible that the company would want to disassociate itself from on of the most recognized brand names in the world. From a marketing perspective, it seems inconceivable to me that it will be easier to sell an "Alphabet" product than a "Google" product, and I don't think that there are very many investors out there who see lots of money making potential in the alphabet. Thus, the only motive that we are left with is that the name change is designed to change the way the company operates. If change is the rationale, the timing seems odd, given that Google just reported exceptional results in its last earnings report, triggering a 16% increase in market capitalization on the news. It is true, though, that Google is still a single-business company, deriving almost all of their revenues from advertising, and that all of its attempts to diversify its business mix have generated more publicity than profits. It is possible that the renaming and reorganization are designed to fix this problem, but will it work? I am skeptical, partly because there is talk that Page and Brin were using Berkshire Hathaway as a model, which makes no sense to me, since the two organizations have very little in common (other than large market capitalization). As I see it, Berkshire Hathway is a closed-end mutual fund, funded with insurance capital, and run by the best stock picker(s) in history, and its holding structure is consistent with that description, where Buffet and Munger have historically picked up under valued, well managed companies as investments, and left the managers in these companies alone. Google, in contrast, is composed of one monstrously successful online advertising business (composed of Google search, YouTube and add ons) and several start-ups that so far have been more adept at spending money than generating earnings. If this name change is designed to alter that reality, it has to attack what I see as Google's two big problems. The first is what I term the Sugar Daddy Syndrome, where the earnings power and cash flow generating capacity of Google's advertising business has made its start ups too sloppy in their investments, secure in the knowledge that they have access to an endless source of additional capital. (Update: Those who are more knowledgeable about Google's ways have pointed out to me that it is quick to lop of projects that don't work, which then makes its new product failures an even bigger mystery. Perhaps, this is a case of a Sugar Daddy with Attention Deficit Disorder!) The second is that Google, for better or worse, has been run as a Benevolent Dictatorship, with Larry Page and Sergey Brin calling the shots at every turn. The fact that Sundar Pichai, the new CEO of the Google portion of the Alphabet, is little known can be viewed as a sign of his modesty and self-effacing nature, but it is also a reflection of the outsized profiles that Page and Brin have had at Google. So, for this name change to work, it has to solve both problems, and here are the signs that will indicate that it is working. First, I would like to see Google refuse to invest in one or more of its start-ups, on the grounds of non-performance and invest in or acquire a competing start-up in the same business. Alphabet's new ventures become more like good start-ups, lean, mean and looking for pathways to make money, and Google Advertising behave more like a seasoned VC, looking for the best place to invest its money, inside or outside the company. (For those in the tech business who schooled me on Google's ways, thank you! I have much to learn!) Second, I would also like to see Mr. Pichai deny capital to a project that is prized by Page and Brin, and have them not over rule that decision. Given the history of Google's founders, the likelihood of these events happening is low, but I give Google better odds than I did Ron Artest, an NBA player with anger management issues, when he changed his name to Metta World Peace in 2011. If value is driven by substance (cash flows, growth and risk), it seems absurd that name changes can affect your value, but I have learned not to dismiss them as non-events. Name changes can lead to shifts in investment, financing and dividend policy that can affect value, but more important, they can have substantial price effects. That may seem irrational, but it is ironic that academics in finance would be so quick to make the judgment that what you name something cannot alter its value or significance. After all, these same academics have learned that attaching letters from the Greek alphabet to their measures of risk (beta) or performance (alpha) provide these measures with a power that they would never possess otherwise. So, who knows? These name changes may all work: Bröd Kitchen might deliver delicious and cheap food, Page and Brin may actually be willing to give up control at Google and Ron Artest could become a Buddhist monk! If it feels like you are reading last year’s business stories in today's paper, there is a simple reason. The Federal Reserve's Open Markets Committee (FOMC) meeting date is approaching, and in a replay of what we have seen ahead of previous meetings, we are being told that this is the one where the Fed will lower the boom on stock markets, by raising interest rates. While this navel gazing may keep market oracles, Fed watchers and CNBC pundits occupied, I think that the Fed’s role in setting interest rates is vastly overstated, and that this fiction is maintained because it is convenient both for the Fed and for the rest of us. I think that there are multiple myths about the Fed’s powers that have taken hold of our collective consciousness, and led us into an investing netherworld. So at the risk of provoking the wrath of Fed watchers everywhere, and repeating what I have said in earlier posts, here are my top four myths about central banks. Myth: The Federal Reserve (or the Central Bank of whichever country you are in) sets interest rates, short term as well as long term. In my last post on this topic, I mentioned my tour of the Federal Reserve Building, with my wife and children, and how sorely tempted I was to ask the tour guide whether I could see the interest rate room, the one where Janet Yellen sits, with levers that she can move up or down to change our mortgage rates, the rate at which companies borrow from banks and the market and the rates on US treasuries. Reality: There is only one rate that the Federal Reserve sets, and it is the Fed Funds rate. It is the rate at which banks trade funds, that they hold at the Federal Reserve, with each other. Needless to say, not only is this an overnight rate, but it is of little relevance to most of us who don't have access to the Fed windows. While there is a tenuous link of Fed Funds rate to short term market interest rates, that link becomes much weaker when we look at long term rates and their derivatives. Why preserve the myth: Giving the Fed the power to set interest rates gives us all a false sense of control over our economic destinies. Thus, if rates are high, we assume that the Fed can lower them by edict and if rates are too low, it can raise it by dictate. If only.. Myth: Interest rates are at historic lows not just in the United States but in much of the developed world, and it is central banking policy that has kept them there, through a policy of quantitative easing The myth acquires additional sheen when accompanied by acronyms such as QE1 and QE2, which bring ocean liners to my mind and a nagging fear that the next Fed move will be titled the Titanic! To me, the answer seems self evident. Interest rates in the US (and Europe) have been low because inflation has been non-existent and real growth has been anemic, and it is my guess that rates would have been low, with or without the Fed’s exertions. In fact, the cumulative effect of the Fed's exertions can be measured as the difference between the intrinsic risk free rate and the US treasury bond rate, and during the entire quantitative easing period of 2008-2014, it amounted to about 0.13%. It is true that the jump in US GDP in the most recent quarter has widened the difference between the treasury bond rate and the intrinsic interest rate, but it remains to be seen whether this increase is a precursor to more healthy growth in the future, or just an one-quarter aberration. Why preserve the myth: I think it is much more comforting for developed market investors to think of low interest rates as an unmitigated good, pushing up stock and bond prices, rather than as a depressing signal of future growth and low inflation (perhaps even deflation) in much of the developed world. That problem will not be fixed by Fed meetings and is symptomatic of shifts in global economic power and a re-apportioning of the world economic pie. Myth: Stock prices are high today because interest rates are at historic lows. If interest rates revert back to normal levels, stock prices will collapse. Reality: Low interest rates have been a mixed blessing for stocks. The low rates, by themselves, make stocks more attractive relative to the alternative of investing in bonds. But if the low rates are symptomatic of low inflation and low real growth, they do have effects on the cash flows that can partially or completely offset the effect of low rates. 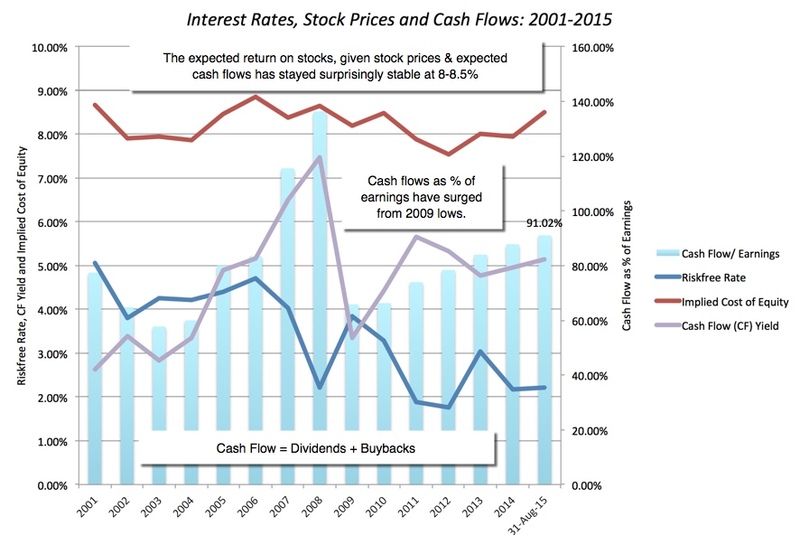 One way to decompose the effects is to compute forward-looking expected returns on stocks, given stock prices today and expected cash flows from dividends and buybacks in the future to see how much of the stock price effect is fueled by interest rates and how much by cash flow changes. If this bull market has been entirely or mostly driven by the drop in interest rates, the expected return on stocks should have declined in line with the drop in interest rates. In my most recent update on this number at close of trading on August 31, 2015, I estimated an expected return of 8.50%, almost unchanged from the level in 2009 and higher than the expected return in 2007. 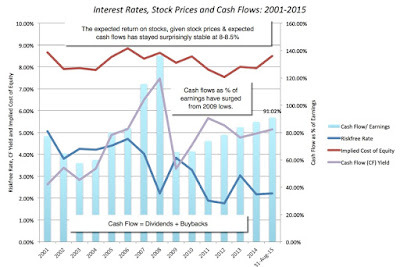 If you hold cash flows constant, an increase in interest rates has a relatively small effect on stock prices, with stock prices dropping 8.76%, even if the US T.Bond rate rises to 5%. In contrast, if cash flows drop, the index drops proportionately, even if interest rates remain unchanged. You are welcome to make your own "bad news" assumptions and check out the effect on value in this spreadsheet. Why preserve the myth: For perpetual bears, wrong time and again in the last five years about stocks, the Fed (and low interest rates) have become a convenient bogeyman for why their market bets have gone wrong. If only the Fed had behaved sensibly and if only interest rates were at normal levels (though normal is theirs to define), they bemoan, their market timing forecasts would have been vindicated. Myth: The biggest danger to the Fed is that, if it reverses its policy of zero interest rates and stops its bond buying, stock and bond markets will drop dramatically. Reality: While no central bank wants to be blamed for a market meltdown, the bigger danger, in my view, is that the Fed does what it has been promising to for so long, and nothing happens. That is a good thing, you might say, and while I agree with you in the short term, the long-term consequences for Fed credibility are damaging and here is why. The best analogy that I can offer for the Fed and its role on interest rates is the story of Chanticleer, a rooster that is the strutting master of the barnyard that he lives in, revered by the other farm animals because he is the one who causes the sun to rise every morning with his crowing (or so they think). In the story, Chanticleer’s hubris leads him to abandon his post one morning, and when the sun comes up anyway, the rooster loses his exalted standing. Given the build up we have had over the last few years to the momentous decision to change interest rate policy, think of how much our perceptions of Fed power will change, if stock and bond markets respond with yawns to an interest rate policy shift. Why we hold on to the myth: If you buy into the first three myths, this one follows. After all, if you believe that the Fed sets interest rates, that it has deliberately kept interest rates low for the last five years and that stock prices are high because interest rates are low, you should fear a change in that policy. Coupled with China, you have the excuses for your underperformance this year, thus absolving yourself of all responsibility for your choices. How convenient? Over the last five years, we have developed an unhealthy obsession with the Federal Reserve, in particular, and central banks, in general, and I think that there is plenty of blame to go around. Investors have abdicated their responsibilities for assessing growth, cash flows and value, and taken to watching the Fed and wondering what it is going to do next, as if that were the primary driver of stock prices. The Fed has happily accepted the role of market puppet master, with Federal Bank governors seeking celebrity status, and piping up about inflation, the level of stock prices and interest rate policy. Market watchers, journalists and economists have found stories about the Fed to be great fillers that they can use to fill financial TV shows, newspaper and opinion columns. I don't know what will happen at the FOMC meeting, but I hope that it announces an end to it's "interest rate magic show". I think that there is enough pent up fear in markets that the initial reaction will be negative, but I am hoping that investors move on to healthier, and more real, concerns about economic growth and earnings sustainability. If the Fed does make its move, the best news will be that we will not have to go through more rounds of obsessive Fed watching, second-guessing and punditry.